I've been on a bit of a Johnny Cash jag lately; listening to his American Recordings series, his historic At Folsom Prison and several CDs of his collected works. I've kinda had Johnny Cash on the brain. And it got me to thinking, "Hey, maybe there's a hidden meaning behind his song titles." What got me going was I Walk the Line. When were were younger the lyrics we sang were, "I keep my pants done up with a piece of twine, because you're mine, just pull the twine". Yeah, pretty silly, eh? Well, you ain't seen nothin' yet. The mantra of the surviving members of the Flying Wallendas. The result of drinking 13 Coronas the night before. What they called that movie before they signed Will Smith to co-star with Tommy Lee Jones. His first request if Norman Bates had gone to prison. Because your mother really, really wanted a girl. The name of your personal injury lawyer. That's the last time I order those double Tabasco sauce-laced burritos with jalapeno peppers. I said that's the last time I order those double Tabasco sauce-laced burritos with jalapeno peppers. The Latino fella that you pay under the table for doing your gardening. 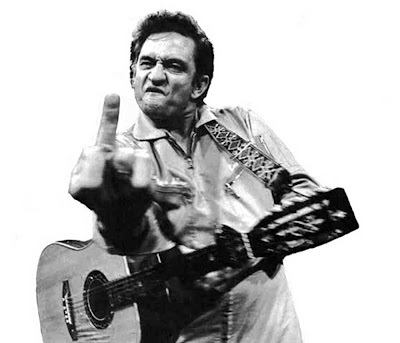 It's also funny that last night the hubs and I were watching Shawshank Redemption (LOVE IT), and we were at THAT scene when Andy becomes a *itch and we said Johnny Cash sang a song about it: At Folsom Prison *itch! Well not for what happened to Andy or the thousands of other prison *itches. Maybe if you play his tunes backwards you will hear the secret message telling you to do something. Just pull the twine. Cute! Quirks: Actually I think that song was "Hurt". Well, isn't that just cosmic... Walk the Line just arrived in my mailbox from Netflix! Perfect timing! I'll be thinking of you as I watch it, Dufus. A boy named sue about a lawyer is sheer brilliance! Boom Boom: And when you open the lid to his casket he says "Close the lid. I'm decomposing". Boom Boom: Great film. Joaquin Phoenix is great. Linda: I couldn't resist. You know what you call 10 lawyers on the bottom of the ocean? A good start! *whispers* Dufe, man, Linda's son is a lawyer. *Clears throat* Funny stuff Dufus! Well, except for that lawyer joke, of course. That wasn't funny at all. Lawyers are people too. I think. Nicky: Linda's son is a lawyer? Wow. I bet she knows some great lawyer jokes! Coincidentally, the week I am looking for my missing Johnny Cash CD and can't find it, I find this post. Maybe I am looking in the wrong places. That being said, did you take it? Hey, how else do you think I knew of these songs. Hey, you've been trolling. Good to see you've been taking yourself on a little tour, here.